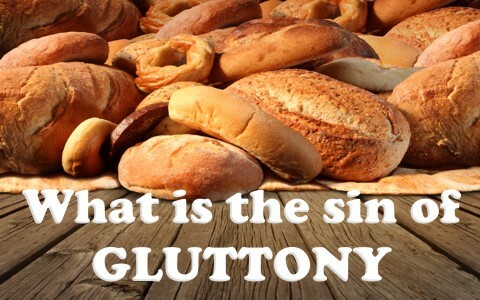 Gluttony is a sin mentioned in the Bible, so what is gluttony? Does it relate only to food and drink? I don’t believe we have a good idea of what the word gluttony means as far as the world is concerned. We can envision a huge 300 pound man gorging himself on food and drink, but is that what the Bible actually calls gluttony? Is gluttony one of the so-called “seven deadly sins?” The word “gluttony” comes from the Latin word “gluttire” and simply means to “gulp down” or “swallow,” but we have somehow made it into a sin and define gluttony as having excess indulgences of food and drink, and to the point of neglecting the hungry. I can see why that can be sin because if this ravenous hunger causes someone to only care about their own needs, then it is a sin of omission, but a sin nonetheless. It is the sin of not feeding the poor at the expense of caring for self. King Solomon taught, “Do not withhold good from those to whom it is due, when it is in your power to do it” (Prov 3:27). This is essentially the same thing that the Apostle John taught by writing, “But if anyone has the world’s goods and sees his brother in need, yet closes his heart against him, how does God’s love abide in him” (1st John 3:17), however does gluttony only involve food? Does the root meaning of the word narrow the definition of it to food and drink? Can we be gluttonous in other areas of life? What does the Bible say about gluttony? Some attribute gluttony as being one of the so-called seven deadly sins which are found in Proverbs 6, but I noticed gluttony is not one of them. Proverbs 6:16-19 says there are six things God hates, and seven that are an abomination to Him (Prov 6:16), and these include “haughty eyes, a lying tongue, and hands that shed innocent blood, a heart that devises wicked plans, feet that make haste to run to evil, false witness who breathes out lies, and one who sows discord among brothers” (Prov 6:17-19). None of these sins mention gluttony. Besides this, the Bible never narrows down seven sins as being more deadly than the others. The greatest sin, and one that God will not forgive, is rejecting His Son, Jesus Christ, but to God, all sin is cosmic treason. Let’s imagine you live a life so perfect where you only sinned once (impossible!). Guess what? That’s still enough to send you (and all of us) to hell. I do see where the Bible teaches that some sins are more serious than others, like with sexual immorality. The Apostle Paul says “Flee from sexual immorality. Every other sin a person commits is outside the body, but the sexually immoral person sins against his own body” (1st Cor 6:18). The person who is involved in sexual immorality is hurting their own body because they become one with the male or female “prostitute” (1st Cor 6:16). Jesus said that it’s not what goes into a man or woman’s mouth, but what comes out, because our words reveal what’s in our hearts, and so “what comes out of the mouth proceeds from the heart, and this defiles a person” (Matt 15:18). Gluttony is more than just consuming food and drink, but if a person constantly indulges all the time, and to the neglect of those who have little or nothing, then it is a sin, whatever you call it. The Apostle John, King Solomon, and other biblical authors suggest that withholding one’s own goods or having the power to do good and not doing it is sin, so we can all be gluttons of our own time, talents, and treasure. If we simply bury them to spend on ourselves, then we are gluttons to whatever it is that we coveted. To have the means to help and not do so when you see a brother or sister in need, is being a glutton with one’s own resources. I know; I’ve done it, but now I try to look at life and my possessions as not even being mine, because they’re not. I am only a steward of these “things,” but people will always be more important than things. The Apostle Paul asks all of us, “For who sees anything different in you? What do you have that you did not receive? If then you received it, why do you boast as if you did not receive it” (1st Cor 4:7)? All I have in this world is all that I brought into it, as Job said, “Naked I came from my mother’s womb, and naked shall I return. The LORD gave, and the LORD has taken away; blessed be the name of the LORD” (Job 1:21). Perhaps if God sees we are not sharing what we have, He might take it away so that another might give to his or her brother or sister who is in need. I can be gluttonous and still not be 300 pounds, because it is more of an issue of the heart than it is of the appetite. How tight do I cling to my money, which I must remind myself, is not mine anyway? How closely do I covet my time over the needs of others? Do I bury the gift God has given to me? What needs do I intentionally turn a blind eye too? To understand gluttony is to understand our human heart. We know that we are coveters. We don’t like to give because we will have less. What a lost blessing that is because it is more blessed to give than to receive (Acts 20:35), not more blessed to keep than to give. By being generous, we’re not really hurting ourselves at all. On the contrary, our treasures on this earth are going to be burned up anyway, but those treasures we sow into the kingdom will be forwarded to heaven and they will be waiting for us where no moth, rust, corrosion, thief, or stock market crash can touch it (Matt 6:19-20). If we have learned anything, I hope it is that gluttony is much more than just eating and drinking too much. Certainly, it can be eating and drinking too much to the neglect of the poor and hungry, but it can be doing anything “too much” to the neglect of others. There is certainly nothing wrong with enjoying this worlds goods, but to see a brother or sister in need, particularly when we have plenty, is not only sin, it is a shameful thing to do (I speak to myself too!). How can we neglect those, especially in the household of God, and call ourselves their brother or sister when we have the means to help but don’t? Let God’s Spirit convict us of our sins of omission and inspire us to do good things (Eph 2:10) by the power of His Spirit, but all for His glory (Matt 25:34-40; James 1:27). Let us be the gluttons who offer our hearts and open our wallets, to become gluttons, nevermore. Next post: Who Was Saint Augustine?